plus Gulfood 2018, FOODEX, United Estates of Texas wine festival events & more! TEXAS FOOD: SELLING TEXAS 24/7 Jason Russo has the same birthday request every year: visit a nice restaurant and eat a great dinner with his family. companies, because I am helping someone else live out their dreams. It’s very rewarding knowing that I am helping to provide for their family, and in return, they provide delicious food for all of us to enjoy. Plus, locally sourced food just tastes better.” Russo knows that eCommerce is a fast moving industry and staying ahead of the curve is challenging. Usually they start with drop ship arrangement, where they’ll provide orders to businesses to fulfill. Once sales pick up, they stock your inventory in-house, and they’ll do the shipping. This allows them to stock your entire line without having to invest heavily in inventory. What: 9th Annual Food, Wine & Brew Fest When: Sept. 9, 2-10 p.m. Where: Harker Heights Details: Vendor opportunities for food, beer, wine, spirits and art with special discount for GO TEXAN members! For more info, contact Gina Pence at (254) 699-4999. What: The Ultimate Womenâ&#x20AC;&#x2122;s Expo When: Sept. 9-10 and Sept. 30 - Oct. 1 Where: Dallas, San Antonio Details: Standard inline booths are $950 in San Antonio and $1,150 in Dallas. For more info, contact Tina Matteri at (866) 618-3434.
and beverage trade show in the Western Hemisphere. For more information, contact Carlos Guerrero at (512) 463-6507. What: Tap Into Downtown Odessa When: Sept. 30 Where: Odessa Details: Craft beer and wine festival. To sign up as a winery, fill out the participation form here. For more information, contact Haley Howey at (432) 335-4683. What: 2017 Opportunity Exchange When: Sept. 27 Where: San Antonio Details: Learn how to get artisanal beauty products on H-E-B shelves. For more information, contact Tessa Benavides at (210) 938-3855. What: Holiday Bowtique When: Nov. 7 Where: Temple Details: This annual holiday boutique market at the Cultural Arts Center is free to the public. Please contact Ami Hooper for more information or to become a vendor. What: Brazil Inbound Trade Mission When: Nov. 11-13 Where: Chicago, Illinois, Atlanta, Georgia Details: This trade mission offers SUSTA companies the opportunity to meet oneon-one with key buyers from Brazil in either Chicago (11/11) or Atlanta (11/13). The deadline to register is Sept. 15. For more information, contact Carlos Guerrero at (512) 463-6507. What: SIAL Middle East When: Dec. 12-14 Where: Abu Dhabi, United Arab Emirates Details: 1,000 exhibitors from more than 30 countries and over 15,000 visitors. Registration closes Sept. 15th. For more information, contact Carlos Guerrero at (512) 463-6507. What: Gulfood 2018 When: Feb. 18-20 Where: Dubai, United Arab Emirates Details: Spots fill up very quickly for this trade show. For more information, contact Carlos Guerrero at (512) 463-6507. What: FOODEX Japan When: March 6-9 Where: Tokyo, Japan Details: Exhibit with SUSTA at FOODEX and be a part of the largest food and drink exhibition in Asia. This 4 day event brings together about 77,000 buyers in one of the best environments to conduct business. For more information, contact Carlos Guerrero at (512) 463-6507. For a complete list of discounted international events, please follow this link. For more information on SUSTA events and GO TEXAN member opportunities, contact Carlos Guerrero at (512) 463-6507.
sunset of long professional culinary careers and wish to hand the baton off to someone to take this company to the next level. If you are interested, please visit their website to see if you may be a good fit. For more information, contact Cynthia Guido. Co-Packer Resource: Need a co-packer? Check out our list of co-packers, who have taken many GO TEXAN producersâ&#x20AC;&#x2122; products to the retail level with packaging and shipping. 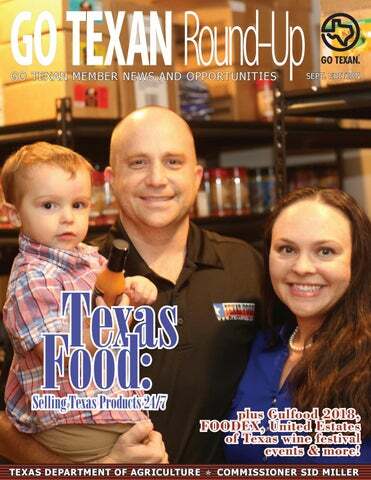 GO TEXAN Members Get discounted advertising in Texas Co-Op Power. Texas Co-Op Power readers are 100 percent Texan. Their monthly circulation is 1.3 million. GO TEXAN members get an exclusive 10 percent discount off any 3x advertising contract (regional or statewide) when using the GO TEXAN mark in your ad. For more information, contact Martin Bevins at (512) 486-6249. Friends and Allies Brewing Company and Live Oak Brewing were both highlighted on Eater Austin. Blue Bell Creameries was highlighted on Eater Austin. 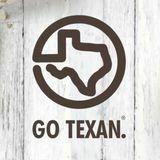 GO TEXAN was featured, along with H-E-B, on PerishableNews.com. Nature Nateâ&#x20AC;&#x2122;s was a featured guest on Life Today. The Pecan Grill at the Overton was spotlighted in Wine Spectator. ntest. Skull & Cakebones was awarded Grand Prize for its Mocha Marmalade. The Texas n Cakes. War Pig BBQ was also awarded First Place ($20,000) for its For Use on Butts and nster Cheese Organic Masa Tamales. Click here for a brief description of each winner. Exclusive news, events and opportunities for GO TEXAN members.